Becky grew up in Hornsea, East Yorkshire and spent many hours walking on the beach, collecting pebbles and sketching the sea. During studying for her Fine Art degree at Newcastle, she spent her 2nd year painting in Finland which has had a lasting impression on her choice of colour palette and remains a strong influence in her work. Becky tries to capture the beauty of tiny, detailed natural patterns that live within the wide expanse of our landscape. 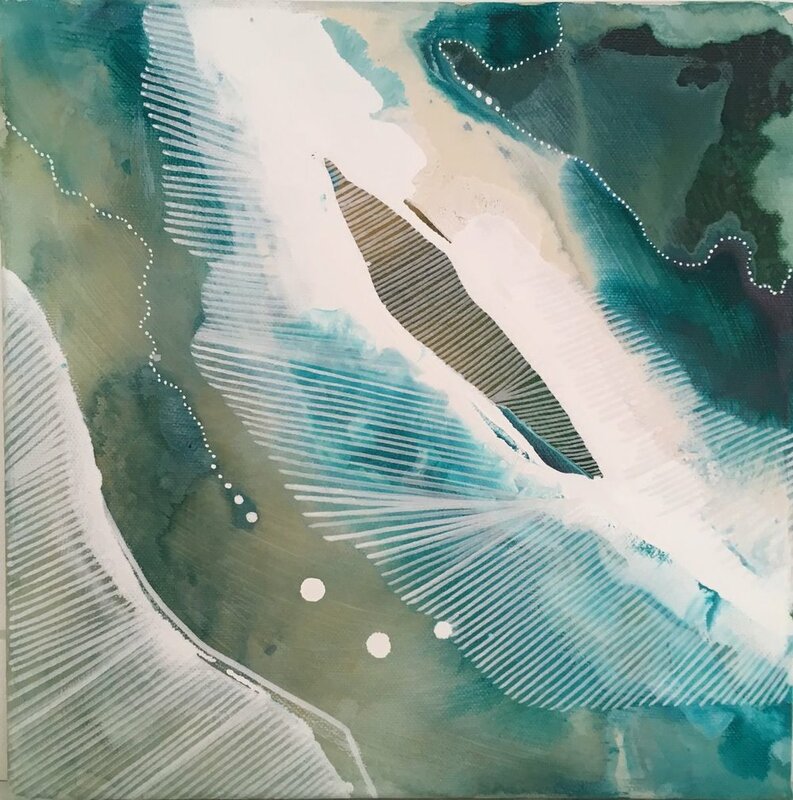 Often inspired by the sea, her paintings have a natural flow to them, connecting patterns within waves to their coastal landscapes. She looks for connections between land, sea and sky and is inspired by the natural colour combinations that she sees everyday, from collections of grey, lined pebbles on mustard yellow sand to soft, green leaves reflected in turquoise blue streams. She is always on the lookout for colours, patterns and tiny inspirations that can be collected, expanded upon and used in her paintings. Becky paints using watercolour, acrylic and ink as these mediums enable her to create fluid, organic movements that reflect nature in a way that she can carefully control. Her paintings have multiple layers of depth and colour, reflecting the layers of the natural world, and she intuitively responds to natural patterns that are produced during the painting process, allowing the process itself to be a creative part of each individual piece. She paints decorative details from patterns and motifs that she finds, from fossils to flowers and leaves to lichen, bringing together tiny patterns from land and sea and intuitively connecting them together.